The Keeley Bassist Compressor provides true high-fidelity compression and limiting. Be heard and felt using performance compression by Keeley Engineering. The Bassist Compressor is built around the exotic and extremely high fidelity THAT Corp. 4320. Think of it as very affordable studio-grade compressor in stomp box format! It uses high performance Voltage Controlled Amplifiers, on board true-RMS detector, and ultra high performance op-amps to bring you the very best quality. VCA compressors give you precise control. Therefore they are directly suited to bass guitars. 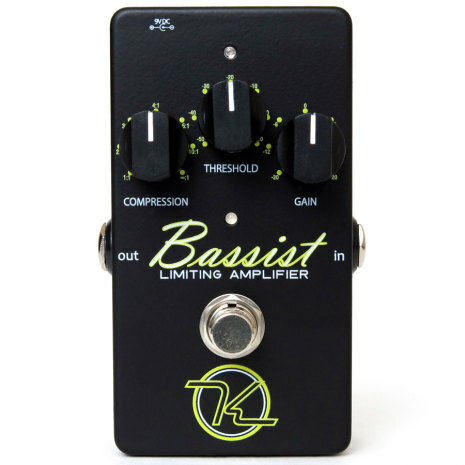 The Keeley Bassist Compressor is both musical and very transparent. Where our older compressors were based on the CA3080 or the LM13700 and are perfect for single coil guitars, the new Keeley Bassist Compressor has no problems with active pre-amps and line level input signals! Not only can the Keeley Bassist handle astonishingly large signals, it has an incredible bandwidth of over 20 KHz and incredibly low noise. No detail in your bass guitar?s tone will be lost. The Keeley Bassist will be a sound investment in your tone, you now have rack-mount quality at your feet. When bass players use the Keeley Bassist Compressor they will be greeted with a sound that is more easily amplified and heard. Using the effect as a limiting amplifier saves your speakers from clipping and distortion. Set the Threshold to look for peaks in your signal and limit distortion from your amplifier or damage to your speakers. Simply watch the Threshold Indicator light to see what type of playing you want to limit, it?s that easy! Next set the Compression Ratio Control to determine how much squash you want when the signal is above Threshold. Set Compression all of the way down for no (1:1) compression and use the Gain control as a boost! Set Compression all of the way up for an above-Threshold hard-knee limiter. There is a certain figure that just sounds good as far as compression goes; and that?s 125 dB/second. With feed forward compressors that use this type of true-RMS detector you use a single time constant parameter. The timing capacitor gives you attack and release times that are adaptive to your playing level or the signal input to the compressor. Bottom line: Attack and Release times vary on program content. Attack times are generally speaking, about 100 times faster than release times.